We also sell related Ironmongery i.e. 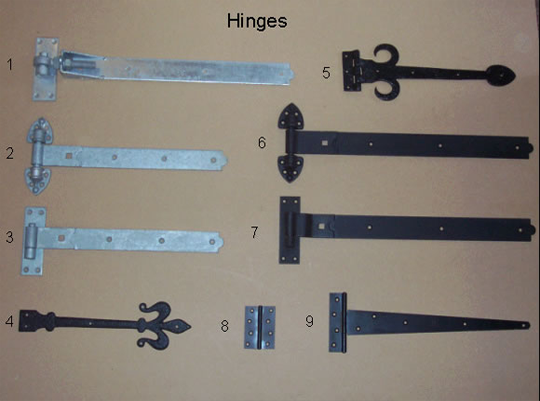 hinges, bolts, locks, latches, plus gate and garage doors Ironmongery packages. Can’t find a standard size single or pair of wooden timber gates to fit your opening size for your passageway, between brick piers or timber posts? Look no further Longman Gates don’t just offer standard size single and pairs of wooden gates, we also offer made to measure bespoke wooden gates. The majority of our gates are produced in house at our production units in Surrey. We have a large selection of timber gates, in various designs, ranging from 5 bar wooden field gates, to pedestrian and front entrance gates, for residential, semi rural, or rural usages. Most of our wooden entrance gates are suitable for automation, with hydraulic rams, articulated arms or underground systems. If you can’t see a design of wooden gates on our website whether it be in Scandinavian Redwood softwood or Iroko, Idigbo and Sapele hardwood we will be happy to quote you a price on your own design, either way please email or phone for a quote. 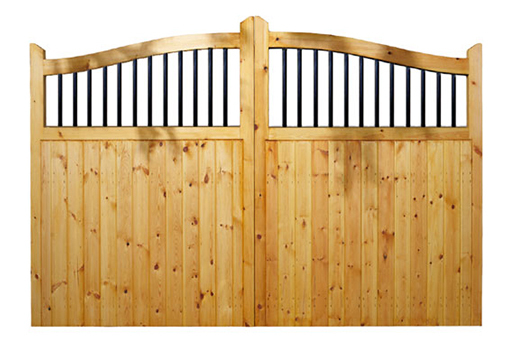 View our Made to measure Wooden Gates and Priced Wooden Gates. As more and more people are trying to retain their properties original heritage features, or looking to obtain replacement garage doors for a 1930s, contemporary or listed building in the UK, then Longman Gates is the company for you. We have good variety of traditional wooden timber side hung garage doors standard and made to measure, produced in various timbers i.e. Scandinavian Redwood softwood, Idigbo, Sapele and Iroko hardwood, which will hopefully suit your requirements. Also with the increase in popularity of green Oak barns, carports and cart lodges we have found not only the builders but there customers are coming to us for made to measure barn style doors in Scandinavian Redwood Softwood, Idigbo, Sapele and Iroko hardwood. Automated and Electric Wooden Gates – British made wooden gates suitable for automation direct from the manufacturer. If you can’t see design of wooden timber garage doors or barn doors on our website, we will be happy to quote you a price on your own design, either way please email or phone for a quote. View our Made to measure Wooden Garage Doors and Priced Wooden Garage Doors. The vast majority of our doors and gates are produced in house which makes us versatile to our customers needs. So if you have your own bespoke design or you have a made to measure size, contact us and we can help you. We also do a range of standard size, 1930s and more contemporary design wooden side hung garage doors, along with driveway gates, country gates, farm gates, field gates, 5-bar gates and single gates. Our doors and gates are manufactured from Unsorted Scandinavian Redwood Pine, Iroko, Idigbo, Sapele Hardwood and 5th Scandinavian Redwood pine. As a company which is conscious of the environment we are taking on board laminated Redwood Softwood Pine stock for use within some of our doors and gates. Please click here for laminated stock. Weybridge, Virginia Waters, Cobham, Farnham, Esher, Ripley, Walton on Thames, East Horsley, Oxshott, Cranleigh, Bookham, and so on. We also supply a large percentage of wooden gates & side hung garage doors to towns/villages within linked counties. Kent covering towns/villages such as Royal Tunbridge Wells, Sevenoaks, Ramsgate, Tonbridge, Eynsford, Ashford, Maidstone, Chatham and so on. Hampshire covering towns/villages such as Petersfield, Brockenhurst, Lyndhurst, Hart, Aldershot, Winchester, Lymington, Basingstoke, Havant, Ringwood, Portsmouth, and so on. Sussex covering towns/villages such as Ditchling, Pulborough, Lewis, Chichester, Brighton, Hove, Midhurst, New Haven, Bognor Regis, Crowborough, Billinghurst, Worthing and so on. Berkshire covering towns/villages such as Ascot, Maidenhead, Windsor, Slough, Newbury, Wokingham, Basildon, Eton, Cookham and so on. Also linking us is Greater & Central London, where are wooden gates and traditional side hung garage doors are very popular in the followings areas, Richmond, Hampstead, Croydon, Kingston upon Thames, Fulham, Kew, Twickenham, Sutton, Dulwich, Westminster, Camden, Kensington, Islington, Hackney, Chelsea, Southwark, and so on. As already mentioned we delivery wooden gates and wooden side hung garage doors throughout the UK and have found other counties are hotspot areas for our products as well our neighbouring counties, like. Buckinghamshire covering towns/villages such as Beaconfield, Marlow, Gerrards Cross, Amersham, Knotty Green, Chalfont St Giles, Iver, High Wycombe, Stoke Poges, Aylesbury and so on. Oxfordshire covering towns/villages such as, Henley on Thames, Witney, Oxford, Banbury, Didcot, Kidlington, Faringdon, Aston, Eynsham, Bampton and so on. Cambridgeshire covering towns/villages such as St Ives, Huntingdon, Ramsey, Duxford, Madingley, Cambridge, Brampton, St Neots, March, Waterbeach and so on. If you are looking for made to measure or standard wooden gates and side hung garage doors, then Longman Gates is the company for you. For advice or further information regarding any of our wooden garage doors, wooden gates, ironmongery or anything else, then please call us on 01342 844 846 or email us at info@longman-gates.co.uk. Continuing the great success of our promotional range of wooden gates in Scandinavian Redwood Softwood in 2017, we will be continuing this offer as long as possible into 2018, so grab yourself a great deal today. 10% off Ironmongery when purchased with any of our standard or made to measure Wooden Wooden Garage Doors. General Information about Wooden Garage Doors, Gates & Materials. Longman Gates is committed to being as environmentally friendly.